Written by Sandra Jurišić. Continued from Into the Land of Folk Tales. 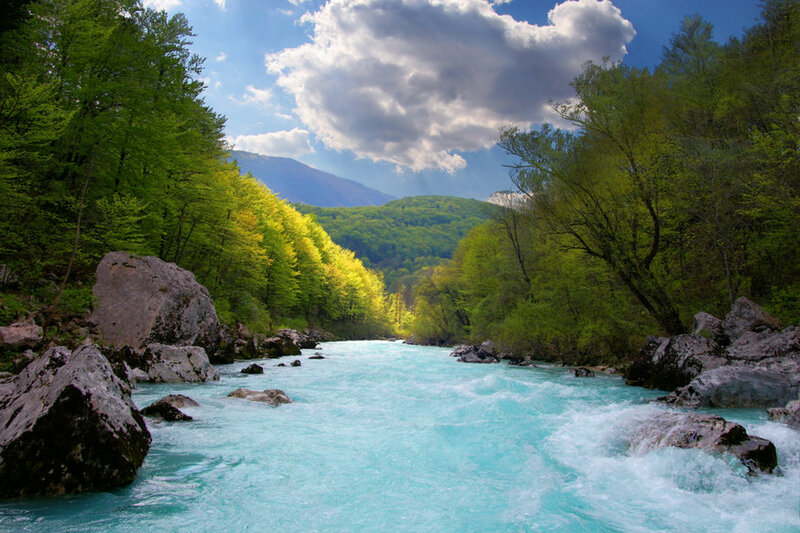 Driving along the Soča river has a number of opportunities to stop and enjoy the wonderful sights. One such sights is the St Joseph church, located near the main road, which is where we stopped next. The church is notable for the frescos by Tone Kralj inside, depicting several Slavic saints, the Archangel Michael fighting with Satan, as well as, interestingly enough, figures symbolising Hitler and Mussolini. Behind the church there is a small WWI military cemetery with quite a large cross made from stones in the grass. From the church our small group made our way to what is probably the highlight of taking this trip – the Soča river itself. There are several bridges crisscrossing the Soča river from which you can observe its Small Troughs, arguably the best one being near Camp Korita. 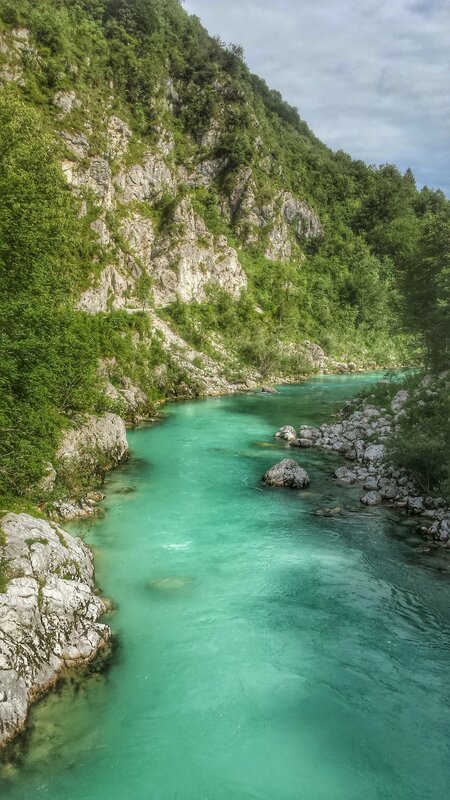 There is a lot to take in, as well, as there is nothing in the world quite like the small gorges of Soča river and the specific azure colour it shines with. It is best to see it on a warm summer day, with the sun high in the sky, when the azure is at its brightest, however we had the slight misfortune of the weather being intermittently cloudy. Perhaps it was those moments, however, when the sun peaked out from the behind the clouds, bringing out that special beauty of the river, that made the experience more impactful. 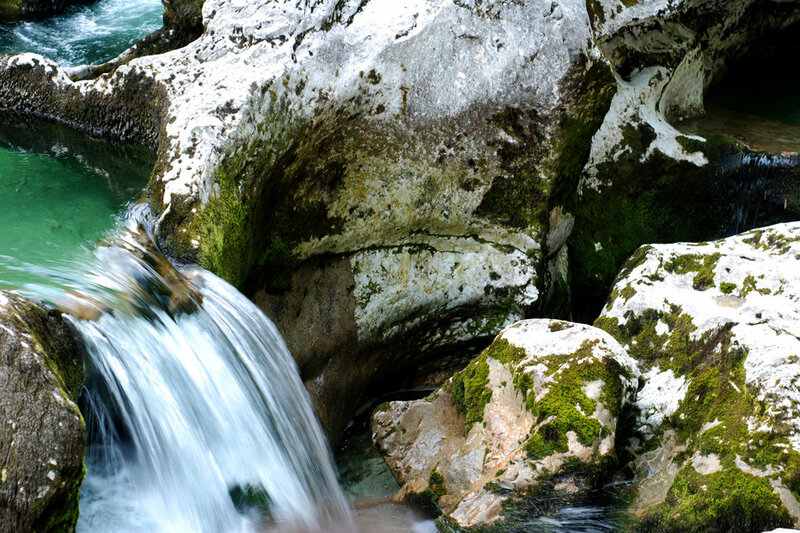 The Small Troughs are but a taste of the gem still waiting ahead – the Great Soča Gorge. The 750 metre wide gorge varies in depth depending on the water lever, but it is an impressive sight in any respect. The turquoise colour of the water seems almost otherworldly, and combined with the undulating smooth walls of the gorge, it makes for an amazing display of the architecture of nature. Looking down from the bridge for long enough, listening to the sounds of the summer, the resonance of the running water is practically a solemn experience, meditative and calming, something that needs to be experienced to be believed. Even though the water is inviting enough, particularly in the summer, we did not swim in it. 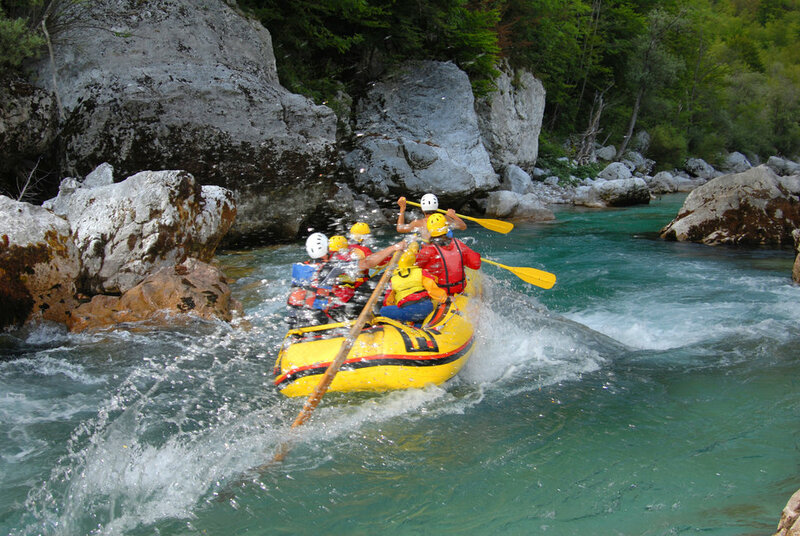 The Soča river does, however, offer a variety of activities, such as rafting and zip lining, which I imagine must be thrilling for the more adventurous tourist. If we had had more time, perhaps we would have attempted a hike, as a view of the river from any side must be absolutely amazing. We did make several more stops near the river, but when its every bend offers incredible photo opportunities, it is hard to decide where to stop and which panorama is the one most worth taking in. The ride along the river Soča eventually lead us to Bovec, a town that might be of particular interest to movie lovers, as parts of The Chronicles of Narnia: Prince Caspian were filmed thereabouts, as well as elsewhere along the river. Bovec is a nice enough town, but it is mostly the starting point to other sights in the region, and it thrives on its tourism. We had our lunch there, in a lovely restaurant, absolutely brimming with tourists. The atmosphere was beyond pleasant and the food excellent, particularly the local dishes. After a short walk through Bovec, onwards we went, and our next stop was the Boka waterfall. With its 106 metres, Boka is not the tallest waterfall in Slovenia, and seeing it in the summer, when its jets are thinner, may not be the perfect timing, but it is still quite an enchanting view. Surrounded by majestic rocks and a wonderfully lush nature, it looks like something straight out of a fantasy tale. Due to our tight schedule, we only had the opportunity to see it from afar, from the main road, but there are several ways to approach it and observe both it and the incredible nature around it more closely. If all that wasn’t enough, the Boka waterfall served as a fitting farewell to the river Soča, as the following turns and bends took us away from the river and towards the mainland. A final statement to the river’s beauty, a swan song for its colour and grace, Boka is the perfect send off to Soča and a pleasant welcome to what comes ahead. Tagged daytrip, geology, gorge, Posočje region, river, Triglav National park. Bookmark the permalink. Vesna, you are absolutely right!